During November 2008, a salvage excavation was conducted in the Sheikh Jarrah quarter of Jerusalem (Permit No. A-5543, map ref. 221830/633470; Fig. 1) prior to construction. 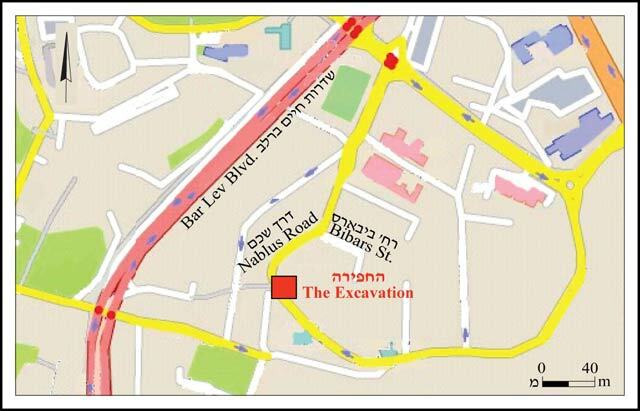 The excavation, on behalf of the Israel Antiquities Authority, was directed by E.D. Kagan (surveying, photography), with the assistance of I. Berin (preparing plans for publication). The site is located atop a bedrock surface that was mostly quarried for laying the foundations of a building. A loculus burial cave that was converted to a cistern in a later phase was discovered in the west of the area, on part of the rock that was not hewn. The excavation was suspended by an inspector of the Ministry of Religious Affairs. 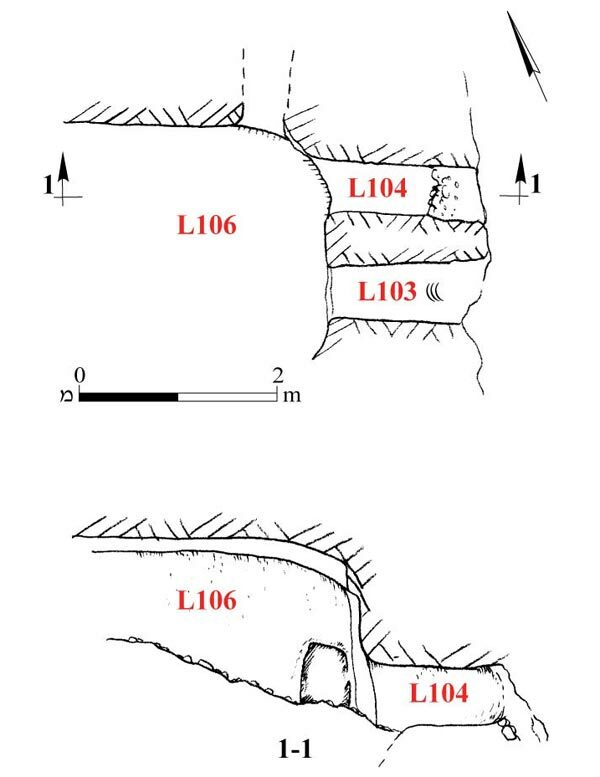 The cave consisted of a hewn rectangular burial chamber (L106; min. dimensions 2.5×3.0 m; Fig. 2). The location of the cave’s entrance is not known. The chamber’s ceiling collapsed and it was filled to that height with erosion from the roadbed above the tomb. An arched shaped niche with two rock-cut kokhim (L103, L104; width of both kokhim 0.9 m) was hewn in the burial chamber’s eastern wall. The length of the kokhim is not known because their eastern end was severed. A similar niche was hewn in the northern wall of the chamber where at least one other kokh was hewn in the northeastern corner. The cave was adapted for use as a cistern in a later phase. The southern kokh in the eastern wall (L103) was blocked by construction, consisting of medium-sized fieldstones and lime mortar. The surface of the cistern and the northern kokh in the eastern wall (L104) were coated with hydraulic plaster containing potsherds. 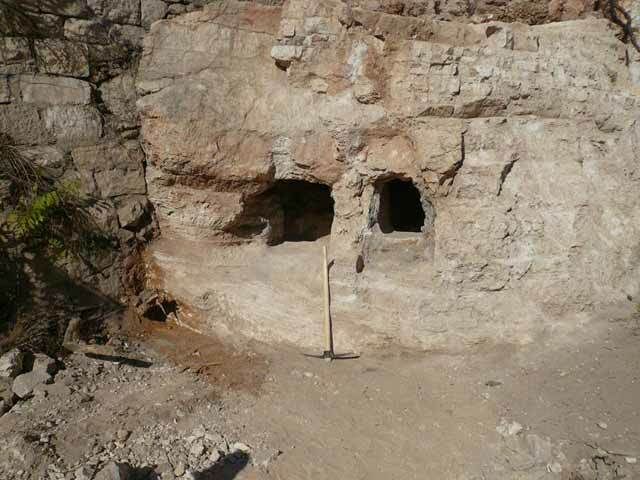 This is a Kokh-type burial cave, characteristic of the Second Temple period. Tombs of this kind had been excavated in the region in the past, the most famous of which is the tomb of Simon the Just, located c. 1 km east of the excavation. No artifacts that might aid in dating the burial cave more accurately, or the later phase when it was converted for use as a cistern, were discovered at the site. According to neighborhood residents, a sabil stood alongside the road that led from Nablus to Jerusalem and the water cistern was probably connected to it. 3. Openings of two kokhim, looking west.